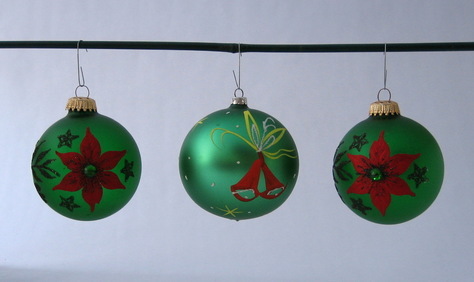 Striking set of 3 silvered glass globe ornaments in deep green, one with painted and frosted decoration and two with applied, glitter, and jeweled decoration. Metal caps (two are embossed) with wire loop hangers. Brought from Germany. In original storage box marked "K�geln 1972" (German for "Ornaments 1972"). Very good condition. Slight wear.